One of the most striking things about the terrain through which the 'Death Railway' linking Thailand to Burma passed, is its extraordinary beauty. Specifically the nightmares of Eric Lomax (played by Colin Firth), a British serviceman who was one of many to suffer cruelty at the hands of Japanese captors overseeing the construction of the 345-kilometre-long stretch of track linking Thailand to Burma in 1942-43. The most famous – and arguably scenic – spot along this infamous stretch of the Death Railway is of course the bridge that crosses the Khwai Noi river close to the town of Kanchanaburi – better known as the Bridge on the River Kwai, immortalised in the 1957 David Lean film of the same name. The grim details are sensitively presented in the excellent Death Railway Museum and Research Centre in Kanchanaburi. Here, through a graphic assortment of photos from the time, artefacts and moving testimonies of survivors captured on film, is the story of how the railway was built as Japan sought to provide a new supply route to its troops in Burma and consolidate and expand its grip on the whole of Asia. Toiling in searing heat and subjected to systemic torture, the conditions in which they worked were unimaginably harsh, and by the end, an estimated 100,000 had died. A large number have been laid to rest in the immaculately preserved Kanchanaburi war cemetery in which simple headstones have been inscribed with messages such as “To live in the hearts we leave behind is not to die” (W.E. Adams, Royal Artillery, 24. 5 November, 1942). Kanchanaburi can be visited as a day trip from the Thai capital. The best way to do so is by taking a seat on the Death Railway itself (3rd class tickets cost around $4.50). Two trains a day leave Bangkok from Thonburi station. 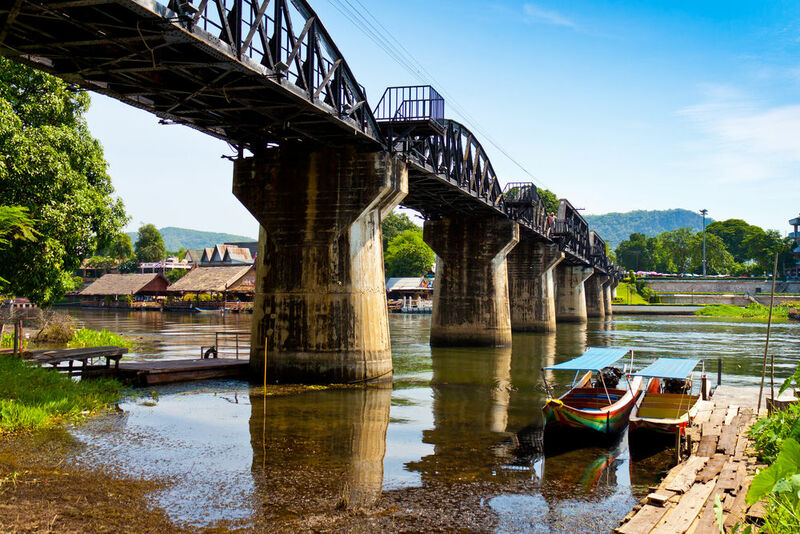 The journey takes you over the River Kwai Bridge and runs along the Kwai Yai before crossing the striking Wampo (Wang Po) Viaduct and heading to Nam Tok. Those wanting a luxurious delve into the past can take the Eastern & Oriental Express train from Singapore. The train also stops in Kuala Lumpur when passing through Malaysia. This article was from The Daily Telegraph and was legally licensed through the NewsCred publisher network.